Beau is using Smore newsletters to spread the word online. 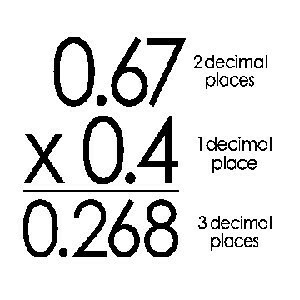 how to multiply & divide decimals. Well, first you must forget that there is any decimal there. You just multiply regular. For intense if you had numbers like 5.8 times 4.7 you would do 58 times 47. whatever you got then you look at how many numbers are to the right of the decimal. For this problem there is one per number. But you only do one. So at the end your number will look something like this...00.0 These zeros will be filled with the answer of your choice (only one answer) This problem below shows sixty-seven hundredths times 4 tenths. Lets see if you can figure out why the answer is 0.268 and how they solved it! !